6.15pm: Get on train and realise the strange looks from people around you are because your tummy is grumbling. Start thinking about dinner. 6.15pm: Realise that you can't remember what's in the fridge. 7.20pm: Pass Sainsburys. Do a 'will I, won't I' dance at the front entrance. Now I'm one of those people who finds it really difficult to throw food away, especially vegetables (for this I blame my Dad, whose fridge resembles a tupperware nursing home), so I often end up making pies, stews and curries which disguise the fact that you've cut the brown bits off the cauliflower or taken a machete to sprouting potatoes. On the plus side however this does usually mean there's something vaguely edible in the fridge. Turning up the radio and turning on the oven, this is what I ended up with. Fry a chopped leek in butter on a low heat, before adding some diced carrots. When softened, add a packet of chopped bacon rashers. Then add chopped asparagus and big chunks of mushrooms, and stir to cook for 5 mins. Season to taste. 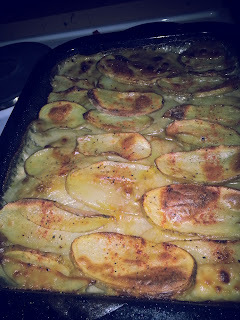 In the meantime, make a bechamel sauce (double the recipe on this blog). If you're using rice flour like me, try to be clever and add enough flour in the first place so that you don't have to whisk it in at the end and risk the sauce splitting in the oven. That's exactly what I did didn't do yesterday. Oops. Add paprika and a little vegetable boullion powder to the sauce, and season. Pour the bacon and vegetables into a dish, followed by the sauce. Mix together and top with two layers of thinly sliced waxy potatoes. Add lots of salt and pepper to the top plus a shake of paprika, and bake in the oven for an hour at 200c. Serve with some salad dressed with a squeeze of lemon to offset the creaminess of the pie whilst catching up on The Great British Bake Off. Perfect! Can I steal your line about the nursing home for Tupperware? Brilliant.